Non-surgical treatment for "Axial Back Pain"
What is Facet Joint disease? Your back bone (vertebral column) consists of multiple bones (vertebrae) linked together by facet joints. Every vertebrae in the spine has a left and right facet joint. These joints allow the spine to flex, rotate, twist and extend freely. Breakdown or degeneration of these joints can lead to pain in the back, arms or legs leading to a diagnosis of facet joint disease. Each joint gets its sensation from a tiny nerve called medial branch. What are the symptoms of facet joint disease? The symptoms of facet joint disease include: tenderness near the inflamed joints; back or neck pain; decreased flexibility of back or neck. Occasionally the pain can go arm, upper back (between shoulder blades) and legs. What is Facet Joint Injection or Medial Branch Block? Facet joints in the spine gets there sensation from tiny nerves called medial branches. During medial branch block we numb these nerves with a local anesthetic medicine (Lidocaine or Bupivacaine). This is a diagnostic or a test block. If back pain or neck pain gets better after this block, it helps Dr. Goswami diagnose facet joint disease. The pain-relief from this block usually last for 6-12 hours. 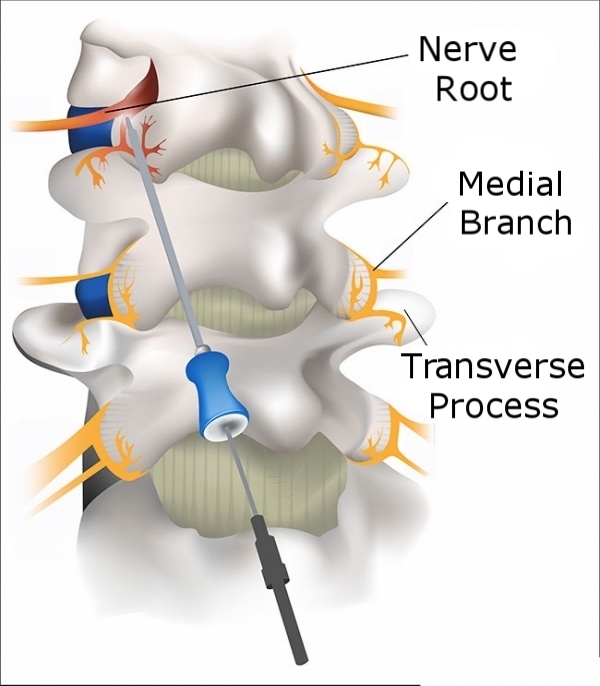 After performing two successful diagnostic blocks, we proceed with Radiofrequency Ablation of Medial Branch Nerve, a more long-lasting treatment. Who needs Facet Joint Injection or Medial Branch Block? Patient with neck or back pain can benefit from this injection. Patients with disc herniation, degenerative disc disease, spinal stenosis also have some involvement of facet joints and might benefit from this procedure. Patients are sedated, numbing medication is then injected at the point of skin entry. A thin needle is advanced near the facet joint under x-ray guidance and a small amount of medication is injected. The injection can be administered in 10-15 minutes. What are the risks and complications associated with this injection? It is generally a safe procedure. But as with any interventional procedure, it carries a small risk of potential complications such as bleeding, infection, leaking spinal fluid & injury to blood vessels or nerves around the spine.